I love my crock pot. I use it often! Several times a week I prepare something fantastic in my beloved crock pot. With a new baby I don't know how I would manage to prepare dinner without it. The last time I put my favorite small appliance to use I realized the interior was looking pretty funky and I made a note to clean it. Now, how does one go about cleaning a crock pot? I saw a lot of suggestions online, from using a general cleaner, to using oxi clean, brillo pads and so on. I thought there had to be a less expensive way to maintain my crock pot so I kept searching. Someone suggested using a baking soda paste and I was anxious to try it. I had a box of baking soda in my pantry and the idea of cleaning without a harsh chemical really appealed to me. This is what my crock pot looked like before I cleaned it. I made a paste of 3 tablespoons of baking soda to 1 teaspoon of water. Then I rubbed the paste into the base of the crock pot. Let this sit for about 20 minutes, then use a damp rag to wipe the baking soda off. The baking soda scrubbed much of the dingy baked on mess out of the crock pot easily. While the crock pot wasn't restored to its brand new splendor, it sure looked a lot better! 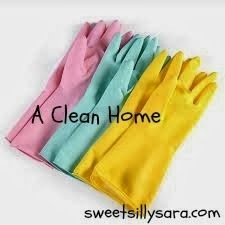 If you have very stubborn stains after the baking soda scrub you can apply dish soap to the stubborn baked on spots and let it set overnight. The dish soap will break up the baked on residue and will wipe off easily with a damp towel. My crock pot wasn't that bad so I didn't require this last step, but I feel confident it would work because If I have a baked on mess on any dishes this is the method I use. If your crock pot needs a good cleaning, this method will work well for you and it will only cost you pennies. How do you keep your crock pot clean? So this is for the inside pot not the actual cooking container? Right? Interesting! I wouldn't have ever thought to even clean the inside like that! I never thought about cleaning the inside of the crockpot but now that I think about it, it is pretty gross. I am stopping by from the Strut your Stuff link up party. Thanks for sharing. My crock pot is 16 years old and I have NEVER scrubbed it clean. I might ought to use a little baking soda on it. :D Thanks for sharing via Family Fun Friday.